I’m not a fan of his suggestions, at least not if what he means is that we should lead with these questions when meeting someone claiming to be a Christian. First, his points are better used as topics for conversation among people. With my friends, we talk about what we’ve been reading, what the meaning of Bible phrases like “born again” mean, how great Jesus is, but we don’t boil it down to three pat questions. That’s just silly. Also, who asks those types of things of strangers anyway? The point of being with other people is to build relationship. What a person believes will become apparent as the relationship grows. If the person needs instruction on a point and the Holy Spirit equips me to help, great. That’s a blessing for me and the other person. But I don’t think I’m supposed to interrogate and catechize off the bat everyone I meet who claims to be a fellow believer in Jesus. Jesus assured his friends that who belongs to him and who doesn’t is known by the one whose opinion matters. He also said that some people might fool themselves about it, but they can’t fool Jesus. And Jesus also pointed out to his friends that some people they never expect to belong to Jesus are actually right there with them in God’s kingdom. It’s passages like these that make me not so interested in Mr. Friel’s three questions. Rejoice with those who belong to him. Now there are three things worth our time and effort. This entry was posted in Uncategorized and tagged catechism, evangelism, Julie Anne, salvation, Spiritual Sounding Board, Todd Friel. Bookmark the permalink. It’s an unfortunate characteristic of Christians–they want to know who’s in and who’s out. it’s weird to me that we preach a doctrine of grace, yet would ask such graceless questions. Graceless is a good way to put it, Keri. I like to view people as those who belong to Jesus and those who are on their way to belonging to Jesus, because I never know really what’s going to happen with those folks. Wow, those are awkward. As you suggest, the questioner seems to be looking for specific right answers rather than showing a real interest in the person’s faith journey. They are awkward, Jeannie, and make me wonder if the person suggesting them actually puts them into practice or not. Yes, and it makes me wonder if the person even knows a non-Christian who they care about deeply. This critique lacks context to what the picture actually is. It’s an advertisement for a DVD in which Todd is out witnessing to people. 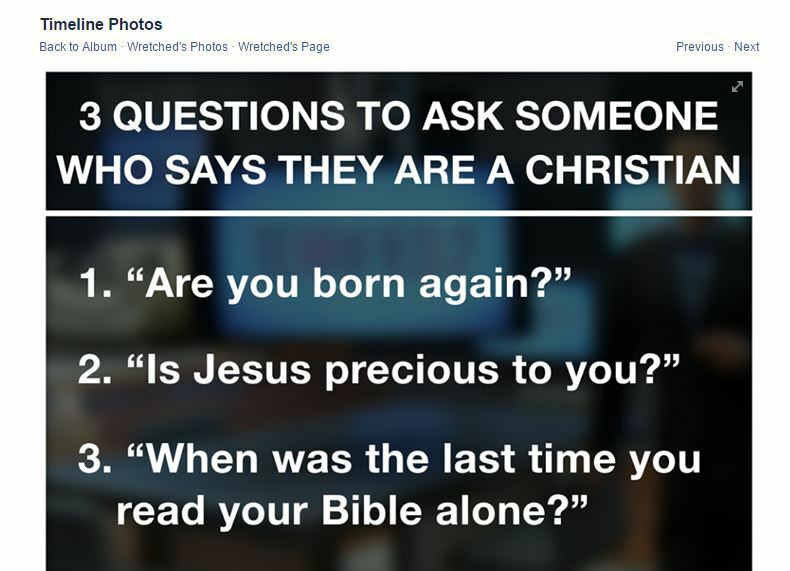 Todd is not using these questions to “judge” whether they are true Christians or not, but to attempt to get the person to examine themselves to see if they are in the faith. Also the purpose of being with people is not just to build relationships. If you are out witnessing at a college campus as Todd is in much of this DVD you may never see these people again. The main thing is to give them the gospel and let God do the work in them. Jesus certainly showed us both ways of interacting with people, Josh – building relationship face to face and preaching to multitudes he might never see again. I’m aware that the facebook photo above is tied to an evangelism program, but that’s beside the point because Mr. Friel is the one who posted it without context. Anyone who wants to know what he’s really getting at has to click through but the picture itself does not suggest there is more context; it looks designed to stand alone as if Mr. Friel really advises those questions when meeting someone who claims to be a Christian. A lot of people listen to and read Mr; Friel’s words and the problem with a facebook graphic like that is many of those people will take it as a stand alone guide that he endorses. On your point about giving people the gospel and letting God work in their lives, I agree and actually just wrote a post on that subject. It’ll be up in a couple weeks. Even as a Christian, I’d hate to be asked those questions, particularly when I’m depressed. As soon as someone asks, “Are you born again?”, I’m leery: am I going to be preached at or encouraged by the followup question? Will this person think I can’t truly be “born again” if I’m depressed or have doubts about God? Are they going to hand me a tract? (I’ve had that happen.) Are they going to pray for me and walk off, or tell me to repent and have joy, or care at all about building a relationship with me or are they just seeing how many people they can share the gospel with? Then, if I were asked, “Is Jesus precious to you?”, depending on my mood–and I have irritable, nasty moods when I’d rather not be a Christian, or when I’m manic, or when I doubt whether Christ is precious to me because I know my priorities are screwed up, or when I’m just ticked off at Christians/churches because I’ve heard about MORE bickering and conflict in various churches I know–I might just answer in the negative, just to be difficult. And the Bible reading question. I’d really have a difficult time with that. It’s always been difficult for me to have a consistent Bible reading time. Having to take Bible as a class, having to read it over and over, and knowing what will be said in the text before I even read it: all of this can drain my desire to read it. I’ve managed it at various points in my life, but it’s been difficult recently. So, while Mr. Friel’s questions may be designed to encourage the person to examine themselves (as Josh’s comment indicates), this self-examination may also cause even a Christian to doubt their own faith (at least if they’re in a susceptible, fragile state of mind). Without having some kind of relationship with the person, the witness doesn’t know if the other person is having mental health issues, and doesn’t know whether their well-intentioned questions might push them toward Christ or toward the edge. All communicators need to be aware that their words can be heard/read by people who are at the crossroads of choosing life or death, and be responsible enough to try to encourage them to choose life. I haven’t seen Mr. Friel’s video, so I don’t know how he leads into these questions. But I would encourage him to rethink his questions and see if they can communicate more caring and love for the whole person. “Is there anything I can pray for you about?” “How can I help you?” Sometimes, the person needs encouragement to keep going for one more day far more than self-examination. That’s what this post needed, Laura, a sound suggestion of how to have a truly constructive and gospel soaked conversation with people. Thank you so much for your thoughtful comment. Tim, the picture you posted is not the entire picture. The entire picture shows a photo of the product in which it identifies itself as an evangelism product, not simply a one off photo. I’m not making the case that you are purposefully misleading people, but the context is literally cut out of the picture that Julie posted. As far as asking someone if you can pray for them about, that’s a good think, but it’s not a substitute for preaching the gospel. John 1 speaks as to ways that a person can know they are saved because God has changed their hearts and desires and out of thankfulness they live a certain way. John was writing to people he didn’t have a relationship with, and he still wrote in this way as does most of the writers of the NT. Paul said the Law is a schoolmaster that shows people their need for Grace. Would you say that we can’t show the Law to someone because their is a chance we may cause a true believer to question their faith? I wish someone had asked me these questions before I was truly saved. I had a “conversion experience” when I was very young, but I had never truly repented and my heart was not changed. I could not have honestly said yes to those questions upon a true reflection. Someone asking to pray for me would have been I nice thing for someone to do, but it wouldn’t have shown me the wretched condition of my heart, and my need for a Gracious Savior. I think asking if you can pray for something is part of preaching the gospel, not a substitute for it, just as asking someone if they would like to be saved from their sin is part of the gospel but not the whole gospel. I appreciate your concern that asking “is there anything I can pray for you?” isn’t the complete gospel. It’s not the complete gospel, but it’s an opening to build a relationship and trust between the witness and the other person. It doesn’t show us the state of our hearts, but it can help the witness to see if the other person is going to be responsive or what is the best tone for the conversation to take. Whereas someone who shrugs her shoulders and says, “Oh, everything’s good,” might be open to a more direct gospel presentation. And the person who tells the witness to f-off might need an approach different from others; I’m not sure what that would be! The person who’s just had ECT doesn’t need a re-emphasis on the wretched state of his soul; he already feels wretched, and being told this again and again will only reinforce the negative bent of his mind. Certainly the NT letter writers used very direct, often confrontational, words. But they usually weren’t writing to individuals but to groups of people. It’s easier (IMO) to handle direct, thorough doctrinal teaching/preaching when I’m not the only recipient. In one-on-one witnessing conversations, though, the witness needs to be discerning and sensitive to the other individual’s emotional/mental state. You are correct, I did not use the entire photo as I do not own the rights, to it, but I did use a portion of it under Fair Use act for discussion purposes. The source link has always been included at my blog site. I posted the image and title and Kathi (part of my team) added a couple of sentences for me as I was busy with schoolwork. Context in this case is really not helpful. It doesn’t matter whether Friel uses the questions as part of marketing evangelism or by themselves (hey, Tim, that could be a post, too, huh? – – should we be marketing evangelism?). The focus was solely on the questions: are those questions important for Christians to ask others, could those questions turn people away from further dialogue, do those questions engage the heart, is it a Chrstian’s responsibility to be the spiritual barometer of another person in determining if they are truly saved or not? That’s what I’ve been wondering too, JA. When meeting someone who confesses Christ, should my first reaction be to make them prove it? I think not. I do not like those questions for a different reason, alluded to above but not addressed. I teach the children in our church (teens too) when trying to share a simple gospel presentation to not use “inside words.” WE know what these terms mean, but non-believers do not. Rather than share a message, the exclusive nature of the terminology builds walls, not bridge. Worse yet, it drives off the likely prospect. -If you die tonight, why would Jesus allow you into heaven? THREE minutes if you are allowed to proceed. If not, that last question will stick with them. There are other phrases-words-questions-approaches. AVOID the “inside talk.” Souls depend on it. I love how the Mark verses are worded here. “Who is not against us is for us.” I’ve heard it turned around most of my life. This wording makes so much more sense! Jesus always makes me think! Well said. I’d like us to get away from the whole “questioning someone’s” salvation thing. That’s just tacky and totally lacking grace. It happens on the internet a lot. “Disagree with me? Wrong politics? I question your very salvation!” Rubbish. Some people have only known Christians within their limited sphere. The idea that someone conservative or liberal or whatever could be a sister or brother in Christian is outside their personal experience.